1) Mix 1/2 cup crunchy almond butter + 2 Tablespoons coconut oil, melted + 1/4 teaspoon sea salt. 2) Pour into a parchment-lined rectangular container so it’s about 3/4-1” thick. 3) Optional (highly recommended! ): Sprinkle lightly with unsweetened cocoa nibs. 4) Freeze for at least 4 hours. 5) Pull out of container & cut into 8 small squares. 6) Keep squares in sealed container in freezer for up to 3 months. What’s the difference between Cocoa nibs and chocolate chips? Cocoa nibs are “nature’s chocolate chip”. They are just dried bits of cacao beans – nothing else added. Chocolate chips (even the most pure versions) have sugar added & other ingredients such as cocoa butter. What’s wrong with cocoa butter? Chocolate Liquor? There’s nothing wrong w/ cocoa butter or chocolate liquor. That’s in dark chocolate, which is definitely a superfood! The only ingredient I try to avoid when buying chocolate is: “milk fat” or “milk solids”. That’s a red flag to me that it’s not the purest chocolate form. 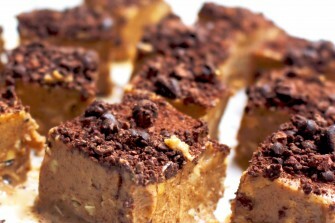 The beauty of this fudge is that it has protein & healthy fat because its base is almond butter…and there’s NO SUGAR! OMYUM! Where can I get cocoa nibs? I’m allergic to coconut. What can I swap for the oil? In the freezer fudge, you need a fat that gets solid at cold temperatures. SO….you can use grass-fed butter or red palm oil (http://amzn.to/1PHYzg1). What are the nutritional differences, if any, between using almond butter versus peanut butter (even if the peanut butter has no added sugar)? Is there an almond butter brand you would recommend? I don’t want to make it myself, and every brand I see in the grocery stores near me have added sugar. My FAVORITE is to get fresh-ground almond butter from a healthfood store (there’s a grinder right in the store)! Heaven. When that’s not possible, I have seen natural almond butter in places like Target & Walmart…brands like Once Again and Woodstock Farms. And there’s always amazon.com! Don’t do it!!! I swear without sugar it tastes great! And it’s great to start looking for places to cut out even the more “natural” sweeteners to help retrain taste buds to like less sweetness. Plus, I’m not an agave nectar fan. Honey, 100% maple syrup or date sugar/paste are all healthier. Not sure what I did wrong but the batch I made yielded a very small amount, nowhere near enough to makes 3/4 inch squares. Would u mind reviewing what I did & please tell me where I went wrong? Used all the measurements as listed but used smooth almond butter instead of chunky (didn’t think it should make too much of a difference) & melted the 2 tbsp coconut oil in the microwave until liquified. Mixed together & poured into a 5.5 x 4 inch rectangular container. Thickness only came out to about 1/4 inch 🙁 Any ideas on what I did wrong? Appreciate ur help! I’m allergic to almonds and tree nuts, making many “healthy alternatives” or “healthy snacks” a toughy. Can I substitute soy butter or sunflower butter for the almond butter?